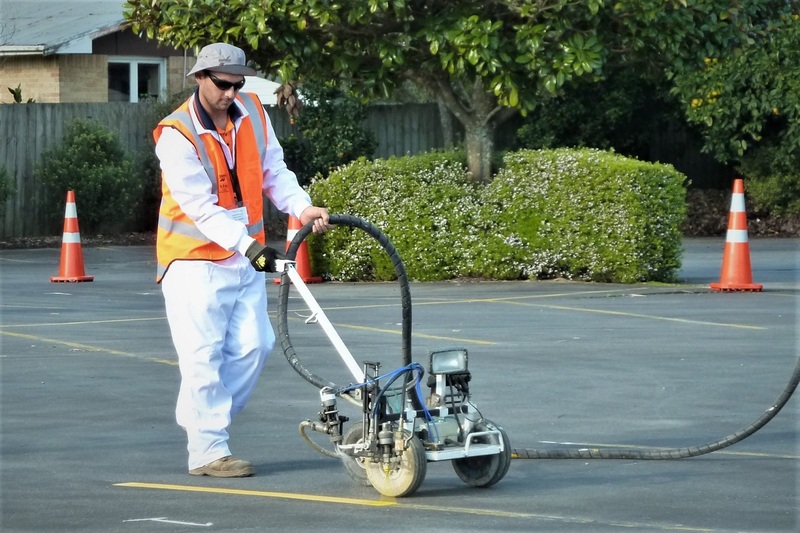 Roadmarkers use machines to apply markings to roads and surfaces such as car parks and sports courts. Source: NZ Roadmarkers Federation, 2018. Chances of getting a job as a roadmarker are average due to stable numbers of people in the role. Pay for roadmarkers varies depending on experience, responsibility, and where they work. Pay rates may increase as they gain qualifications, heavy vehicle licences and dangerous goods endorsements, and first aid certificates. Roadmarker assistants usually earn $18 to $20 an hour. Skilled roadmarkers, known as operators, can earn between $20 and $40 an hour. Source: New Zealand Roadmarkers Federation, 2018.
load trucks with equipment and supplies. travel locally to work sites and may stay away from home at times. What do you like about your job as a roadmarker? "Being outdoors, driving to job locations around the country and overcoming the challenges, as there are always issues which I have to resolve. "I like the satisfaction of completing a job and receiving positive feedback from clients. Driving through a job site at a later date I’m still chuffed about the work I’ve done. What do people need to know about roadmarking? "During summer we have to make the most of the fine weather and we usually work 60 to 70 hours a week. Winter is the complete opposite – we work less hours and they are usually spent doing training or maintaining our equipment." "There's no shortage of bad drivers around worksites. They come in all shapes and sizes, from learners to your own work colleagues, so being able to manage hazards is a day-to-day challenge. "But I like knowing I’m playing a major part in keeping road users safe – if it wasn’t for the painted lines on the road I’m sure there would be a lot more accidents." There are no specific requirements to become a roadmarker. They usually start as roadmarker assistants and receive traffic control training to work in temporary traffic management. can pass a pre-employment drugs test. A heavy vehicle licence (Class 2 to 4) for driving roadmarking trucks, and holding a dangerous goods endorsement (D) are useful. Roadmarkers gain skills on the job and may train for the New Zealand Certificate in Roadmarking Assistant (Level 2). Level 3 and 4 New Zealand certificates in roadmarking are currently being developed. Contact the industry training organisation Connexis or the New Zealand Roadmarkers Federation for more information. at least five years' experience in the industry and documentation, such as a logbook, to prove you have a high skill level. There are no specific secondary education requirements to become a roadmarker. However, maths, English, construction and mechanical technologies, and physical education are useful. Being a roadmarker could be for you if you would like a job that’s adventurous, where you are out every day with your team and you won’t be sleeping in your own bed every night. Roadmarkers need to be reasonably fit and strong as they do heavy lifting. the Government's emphasis on road safety, meaning high demand for new road markings, including high performance markings and rumble strips. There are fewer than 150 skilled roadmarker operators in New Zealand. At this level staff turnover is low, so it is more difficult to get a job as a roadmarker operator. Roadmarkers tend to have more work in summer when temperatures are warmer and roads are dry, and less over winter, so contractors usually take on more roadmarkers between September and May. Working as a roadmarker assistant on a casual basis during the busy summer months is a good way of gaining experience and can lead to a permanent position. When the weather is too cold or wet for roadmarking, companies that do other roading construction work may employ roadmarkers to perform other duties. Having a heavy vehicle licence or skill using heavy machinery may help your chances of finding full-time work. 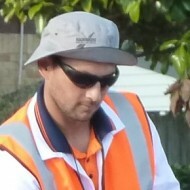 Roadmarking assistants are usually employed through labour hire companies. Roadmarkers are mostly employed by Downer, Fulton Hogan and Coastline Markers. Some roadmarkers working on car parks and sports courts are self-employed. Harlow, A, executive director, New Zealand Roadmarkers Federation, careers.govt.nz interview, August 2018. Ministry of Business, Innovation and Employment, '2003-2014 Occupation Data' (prepared for Careers New Zealand), 2015. New Zealand Ministry of Transport, 'Government Policy Statement on Land Transport', 29 June 2018, (www.transport.govt.nz). Roadmarkers usually start as roadmarker assistants, doing traffic control, and progress to work as skilled operators. They may choose instead to specialise as Site Traffic Management Supervisors (STMS). Skilled operators can become supervisors or managers. Roadmarkers operate machines to renew or install markings on surfaces such as roads and carparks (Photo: Morgan Rouse).